Crystal beads on a plated brass chain. Plating and bead colors as noted. Special Notes: color has a very nice iridescent sheen like and oil slick. Special Notes: Please note: This chain is rough at the ends of each ring. Great for non-jewelry use or you will need to file it smooth. color goes well with Nickel Silver (doesn't match exactly though) You may prefer plat for NS rings. ***This is silver plated but not enamelled. It will tarnish. Special Notes: This chain is silver plated but not enamelled. "Silvered" means there is a layer of silver on top of the copper before the color and plastic enamel layer. This silver layer means the colors are typically brighter and lighter than you can get with just color on copper. Price ranges from 626cents US to 835cents US each. PLEASE NOTE: this chain is now rounded - not made from flat links as shown. New pictures are coming. The 22g is still flat. Commercially pure titanium, rings welded closed. 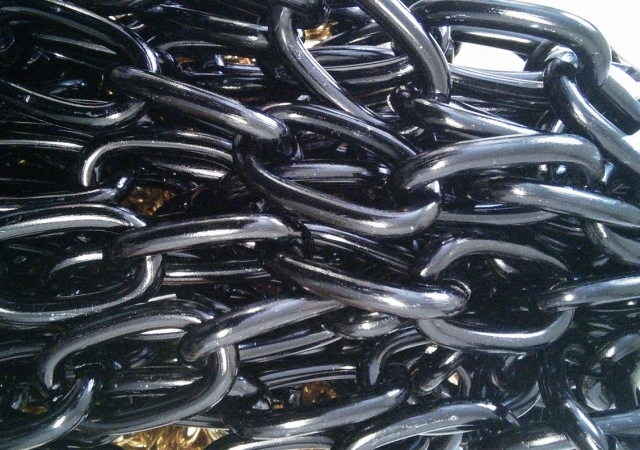 The welded areas of the chain also affect the colors - the chain will not be 100% the same color. There will be variation! * No Color is $1.00 less than the price listed for the colors. Dimensions are 0.8x3.1x3.8mm. Loops fit max 20g (0.08") in center of chain and 18g (1.2mm) at end of chain. PLEASE NOTE: the welds on this chain will not anodize like the rest of the chain. If you are using this to anodize yourself, please note this difference. It is not a reason for return or a defect. 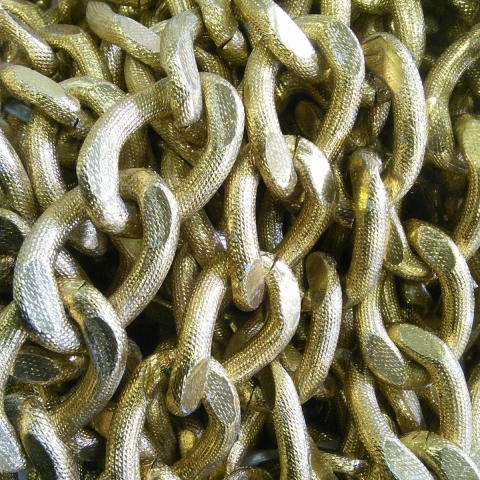 This chain is solid - the ends of each ring are welded together and its very strong. Loops will fit a max of 0.8mm wire (20g 0.032") thru a loop at the end of the chain. In the middle of the chain this doesn't fit. * Black is currently on sale and is 20 cents cheaper than the price listed for the colors. Special Notes: Please note: The current stock of black leather cords seem to have a high rate of failure at the ends. The clasp end pops off. You can glue this back on! Chain are sold individually and all have the clasping end.